The new Special Issue #1 of Báiki: The International Sami Journal is now available! This issue features North American Sami community art with an overview of the history of North American Sami art and the North American Sami Community Collection of art and artists of the international art project Imago Mundi: The Art of Humanity. 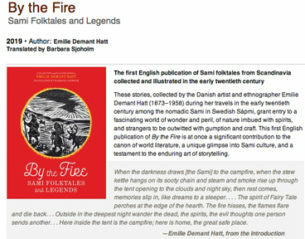 You can order your copy from the Sami Cultural Center using the PDF form. Please note: This is not a subscription issue of Báiki. Subscriptions have now been discontinued and Báiki is available as single issues only.